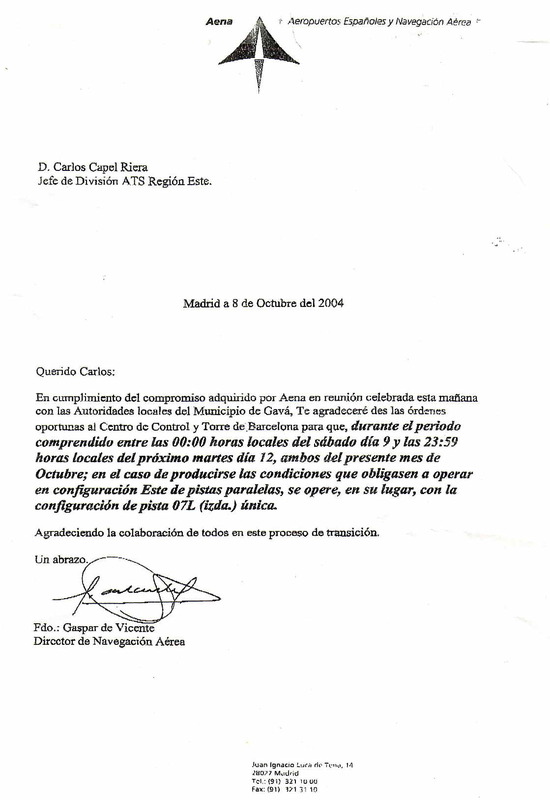 20) With the third runway in use, the City Council of Gavà went through a serious crisis as the inhabitants of Gavà Mar felt deceived and asked the mayor for a solution. 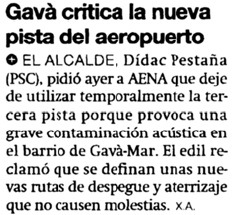 A) What was the situation like in Gavà Mar when the third runway was put into service? B) How was this respite achieved? Then the mayor faced up to the harsh reality; that is, all the predictions the AVV Gavà Mar's technicians had made were coming true, The situation was a disaster. The political circumstances could not be more favorable for his negotiations since the Catalan Government was ruled by a tripartite (PSC, ERC and ICV-EUiA), led by Pasqual Maragall (member of his own party, PSC) and heading the Spanish Government was José Luis Rodriguez Zapatero (from PSOE, ruling the country without absolute majority). AENA's Aerial Navigation Manager (Gaspar de Vicente) ordered that, in the event of having to apply the EAST configuration, only the main runway (07L) should be used, instead of using the third runway (07R), between October 9th and 12th. C) WHY DID THE RESPITE IN THE USE OF THE THIRD RUNWAY OF EL PRAT AIRPORT END ? 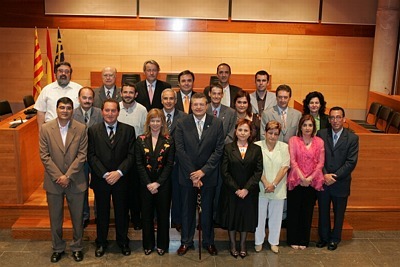 On October 21st, 2004, Dídac Pestaña (mayor of Gavà) (PSC) announced in a press conference that after 15 days of intense meetings with the highest managers of AENA, the 'CSAAB' held an emergency meeting during which AENA had only committed to carrying out a proposal of minimal use of the third runway in the EAST configuration by November 15th, 2004. He also announced the creation of a permanent office aimed at managing this conflictive situation that would be placed in the Civic Center of Gavà Mar. It would coordinate all the legal, technical and computer aspects. Finally he released a political statement agreed upon by all the political parties which was to be presented in the next plenary session, and he expressed his will to involve the Catalan Government ('Generalitat') and the Spanish Government in the search for a solution. 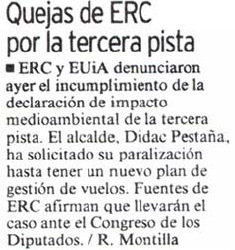 On November 11th, 2006, the mayor of Gavà (Dídac Pestaña) (PSC) gave a press conference in which he kept asking that the third runway not be used in the East configuration. He was glad that the Minister of the Environment (Cristina Narbona - PSOE) had publicly admitted that the 'DIA' was not being fulfilled. He was also happy about the decision made by the Catalan Ministry of the Environment to install sound meters in Gavà Mar.